Today’s Twinspin is about breast feeding. If that makes you uncomfortable, you may want to mosey on over to another blogosphere. After having two sets of twins and three c-sections there’s little shame left. But I do promise no surprise gawker photos. I should also say up front – I do not promote the “breast feed or bust” mentality (no pun intended). I’ve bottle fed and breast fed (simultaneously) all of my children. Sometimes it works. Sometimes it doesn’t. This is simply about where we are. And where we’ve come from. Way back when (oh…8 plus months ago) when Kitty Pillow and I were first introduced, I figured we had maybe six months ahead of us. Six months of commitment. If I was lucky. After that, Kitty Pillow would be BURNED as requested by its previous owner. But here we are 8 and a half months later and I am still nursing my boys. The love affair is going strong (mostly with my boys – less with the pillow). But I don’t even notice those loud kitties anymore. They just melt into my flesh as I circle the pillow around my jelly stomach and heft my (now 17 pound!) babies onto each side. I think I’m more amazed than anyone else that we’ve lasted this long. Nursing twins trends more toward utilitarian than utopia. At least at first. When learning to breast feed two babies you feel, well… FUNCTIONAL. Jostling them, trying to keep one on while the other falls off, getting them positioned just right. Going into complete neck spasms craning down to make sure both your newborns latch right. For the first few weeks you have to have someone hand you the babies, they’re so fragile, bobbily, tiny. Relax? Is she kidding? My shoulders are pinned to my ear lobes, my hip flexors and calf muscles are permanently contracted, my knees are trying to kiss my nose in an attempt to keep the babies from rolling off my lap. And I can feel the beginnings of carpal tunnel syndrome in both of my wrists! Relax!!??? But it got better. At least with my boys. All three of us caught the hang of it rather quickly. Soon I had the drill down: Bring the boys to the bed – one at a time. Stack the pillows behind my back three deep. Slide onto the bed. Click Kitty Pillow into place and cinch. Bring one baby into football hold. Bring second baby into football hold (so they are facing each other). Latch babies – one at a time. Slide blankets under their heads for added support. Lean back. Draw knees up so they can nurse at an angle. Let the milk flow. And yes… I actually got to the point where I could… Relax. It’s been such a sweet bonding experience I kept the late night feed much longer than I did with my other children. And I’m just barely dropping the early morning feed. Because I know these are my last babies. And it makes me, well, a little sad. The other night Doug was commenting on how long we’ve lasted – our little trio (quartet if you include the pillow). So different from my experience with Ali and Sami. Sami nursed like a champ. Always ready to eat. Latched beautifully and took full feeds. Ali did a fair amount of crying. Didn’t want to eat on the same schedule as Sami. Cried when I put her to the breast. Didn’t like a bottle from a stranger. I spent countless hours in our bedroom listening to her cry while I tried to relax (there’s that word again) so I could nurse Sami. Try that. Relaxing while your baby screams non-stop just inches from you, and you can do nothing for her! It was a nightmare. Finally, I gave up on the idea of breast feeding them together. I could tell it wasn’t going to work for Ali. But I wanted her to have my milk. So I decided to pump a bottle for her. And here’s how I managed for the last two months of my breast-feeding career with the girls. Doug called it the TRIFECTA. (Although he never saw it). THE absolute, stone-face, legitimate TRUTH is that I nursed Sami on one breast, held the pump to the other breast (with the same hand/arm I was using to cradle Sami) while I bottle fed Ali (who was lying at an angle in the crook of my knee) with my free hand. Can you picture it? Crazy?? Ummmm…. yeah. Like insanely ridiculous! But I did it. For two months! Do I have pictures? Of course not! If there was any semblance of a human being nearby, I gave them a bottle and put them to work! But most days I was by myself. And doing all of those things separately (feed Sami, pump for Ali, bottle feed Ali) would have taken so much time I determined to consolidate – multi-task to the max – even though it meant pulling off a Ringling Brothers Circus act. Nursing my boys, however, has been like therapy. Maybe it’s those peace-giving hormones induced by lactation. Maybe it’s the non-guilty excuse of sitting down and doing “nothing” for a while. Maybe it’s the seamless bond between mother and baby. The connection. The touch. The closeness of skin to skin. Some of the happiest moments of my day are when the three of us are interlocked together. I love how their eyes tease me, smile. The way they grab at my hair, brush their hands over my face, twirl my clothes, reach out for each other. How they weave their fingers together, hold hands. I love feeling their warm cheeks on mine as we finish and I laugh with them, love them, press them tightly onto my shoulder, wishing I could still time, remember the warmth, and forever feel the purity and preciousness of it all. It’s getting a little raucous these days though. They’re so long I’m five pillows deep now. I have to tie my hair up so they won’t pull it out in clumps. I have red scratch marks on my chest, neck and face if I don’t clip their nails short. And occasionally they stop feeding because one has gouged his brother’s eye, yanked his lip or scratched his face. Yesterday I felt Gordy pull off only to discover he was sucking on Spencer’s fingers instead! And where were Gordon’s fingers? Plucking away at my lips! It’s a bit crazy. The Kitty Pillow is getting tight. We’re running out of room, outgrowing each other. But I’m not ready to let go yet. Not quite. We’ll see how long we can last. Before I have to burn the blessed Kitty Pillow. Life is funny. These days, instead of burning, I think of bliss. Any twin moms out there? I’d love to hear from you. Five children in four years, including two sets of twins, brought new meaning to Mary Oliver's earnest question. Our little people aren't so little anymore, but life is still wild, still precious. And this is my meager attempt to hold on, make it last. I love Doug, running, hiking in the mountains, oatmeal chocolate chip cookies, the edge of an ocean, and connecting with you here. So happy to have you along. Catherine, thanks for this post. I am still trying to get the hang of breastfeeding two at the same time and it is pretty tricky. I've also been doing the pump and breastfeed thing while trying to get my milk supply up after the stomach flu. It is pretty crazy sometimes. But we are making progress, and I appreciate your encouraging words. Bonnie – hang in there! I'm amazed you've done so well after your re-admit, the flu virus taking over the household, etc. Did the babies stay healthy? And did you get a new pump through PwC's lactation program? After using the hospital pump, the small battery-powered, hands free pump by Medela saved my life! Every twin Mom has to figure out how to make it work their own way, with their own babies, on their own turf. From what we can tell, you are doing beautifully! You and David are fabulous parents. Looking forward to swapping twin sagas in the future. ps…tell deb that unless she is afraid of me…my email is camikes@hotmail.com if she would add me to her blog list!!! Cami! So glad to connect with you! Denver. Okay! Not too far but far enough – you know? Great place. Glad to hear Cam finished residency. What did he end up specializing in? Your family is so darling! So happy to keep up with you now through the blog world. And hope to catch up with you in person soon! Love you guys! Catharine, Dorothy gave me your blog address months ago right after my twins were born. Hope you don't mind-I really love reading your posts-you remind me how special being a Mom really is. I really appreciate this post. It took 10 weeks for nursing my twins to become comfortable for all 3 of us. They're 6 mo. now, and I am so grateful for our quiet feeding times-through ear infections, colds, missed naps, we always have our quiet time together-and I'll miss it when it's gone. I thought making nursing work was going to break me, but it has turned into a blessing. As great as many of my nursing memories and feelings are, burning the EZ to nurse also sounds a bit appropriate. With the girls refusing bottles, nursing has ruled my life the last 6 months. Having these twins has brought highs and lows that I had never imagined-what an adventure they are! Meagen – funny how our paths continue to parallel after a lapse in communication. You were on my mind just a few days ago. So glad to hear the nursing is going well. Really? They are six months now!? How wonderful. AND TEN WEEKS? That was some serious perseverance! Way to push through the hard days! I SO appreciate your comment. I'm sure other twin moms will appreciate hearing from you in the future. Glad you posted. Shall we have a communal burning of our EZ2 pillows six months from now? What do you say? Not a twin mom, but I can relate to the scratching of the chest, sticking fingers in my mouth, etc. I am just about to wean, so your post was particularly meaningful. Ethen is ready, but it truly is hard to let this special time go. However, I am glad he is taking the bottle now, although I load it with Strawberry Nesquik. Shir! Glad Ethen is taking a bottle! Hurray for YOU! Strawberry Nesquick – hey! whatever it takes, right? (So you can find Nestle there?) Good luck with the weaning. Let me know how it goes! Wow, I love nursing more than almost anything as a mom, but twins sounds like madness! Jonathan would not nurse, and after three months of frustration, I started pumping and feeding. That would not have lasted 9 long if not for necessity. But the act of actually sitting down and feeding my babe's, is priceless. So glad it is still working for you three! Cherish it while it lasts. Mali's trying to figure out how to wean Jane, and she's almost 2 1/2! She has always loved breastfeeding our kids, but she's never had to try double-duty. Kudos to you for being able to handle it! Your description of getting yourself and babies arranged to nurse, sounds exactly like mine did! I had the same pillow (different print). 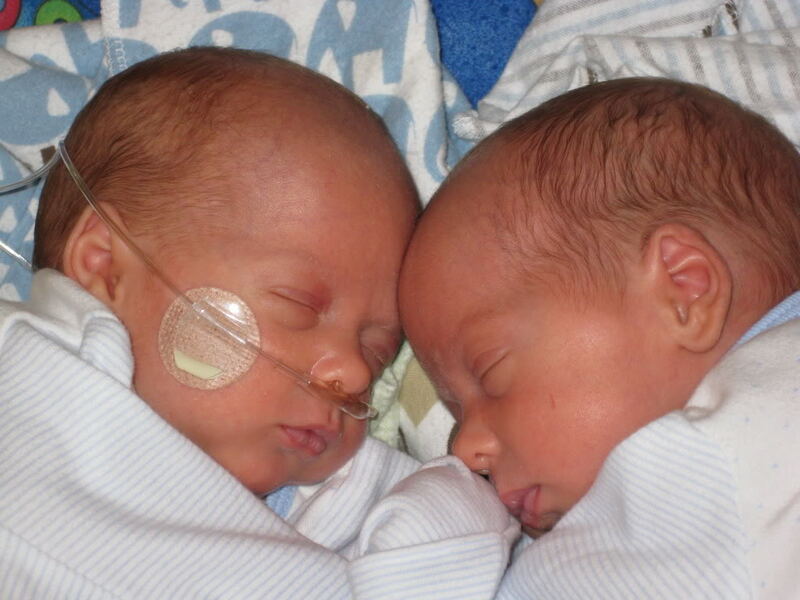 My boys are 18 months old now, and I do look back on those nursing days sweetly and fondly. I loved nursing my twins, because with another toddler in the house, quiet time with each baby is so precious, and nursing gave me that time to just sit and look at their faces!